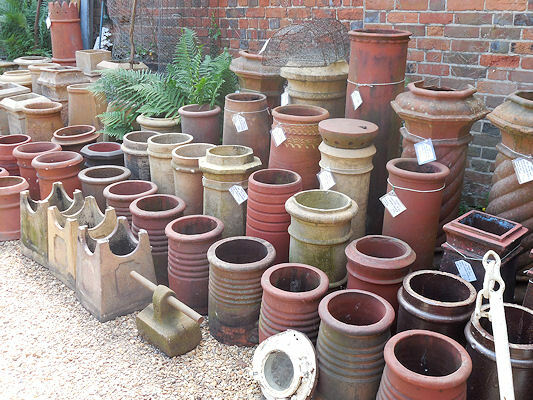 Many original, quality, early 19th century or older chimney pots are usually available. 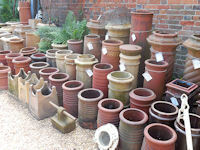 See our "Chimney Pots" section for more details of those available. 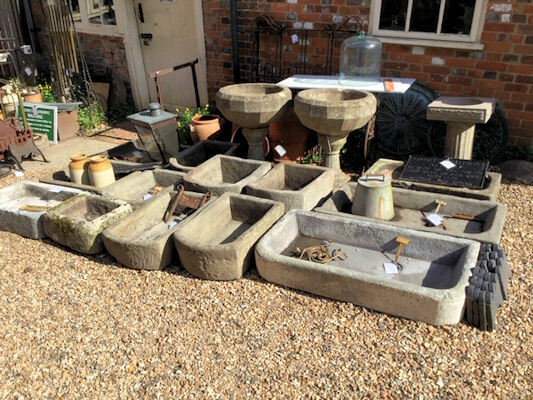 Many original, quality, early 19th century or older stone sinks and troughs are usually available. See our "Stone Sinks and Troughs" section for more details of those available. 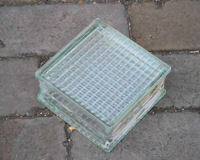 Original, quality 1960's clear glass block, with a cross hatch detail to the front and back surfaces. 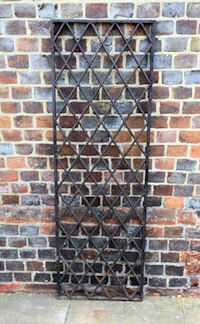 These were popular as interior room dividers but could also be used for exterior glazing. Some old paint to the sides, otherwise complete and in good order. 7.75" x 7.75" x 3" front to back. 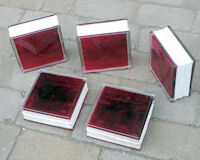 Original, quality 1960's overlaid clear glass block with red glass interior. 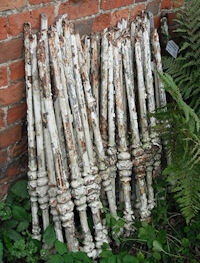 These were popular as interior room dividers but could also be used for exterior glazing. All perfect and complete.7.5" x 7.5" x 3" front to back. Price is for each. 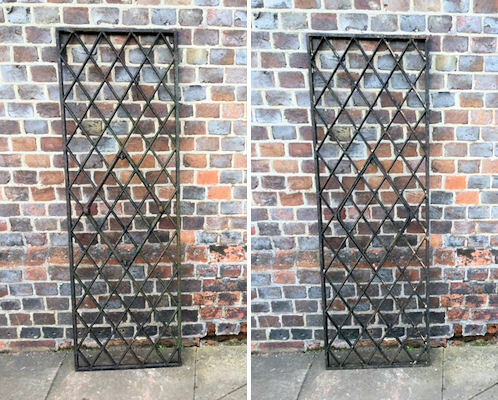 Original, quality mid to late 19th century blacksmith made, decorative wrought iron ' D ' shaped panel probably from an entrance / archway overthrow or in front of a window over the front door. This superb example is two sided in relief and has detailed acanthus leaves, some of the original gilding and six mounting plates, each with two countersunk screw holes for mounting. A great looker and not easy to find these today. D shape 54" x 25" tall, mounting brackets at base 2.25" each other brackets 3.25" each. 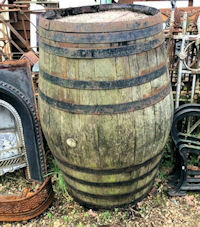 Original, quality huge 1920's cooper made oak wine barrel with ten thick wrought iron bands. This barrel of gigantic proportions will hold together tightly if kept full of liquid or outside to the elements. 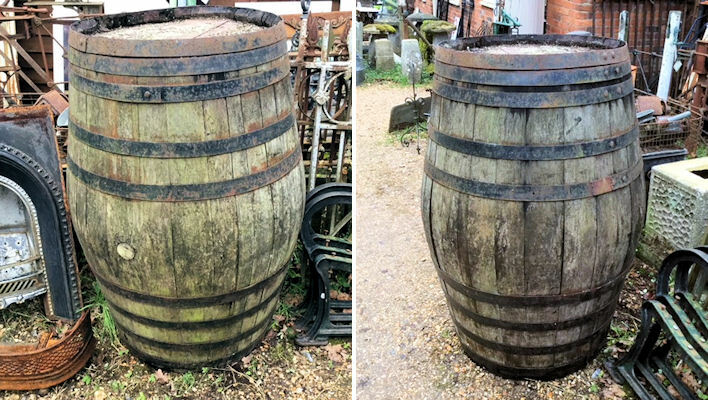 A great looking barrel with many uses. Complete and in good order. 49" tall x 27" base diam and 31" widest in middle. Price is for each. 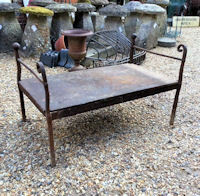 Original, quality late 18th or early 19th century blacksmith made wrought iron base with a heavy sheet iron plate, would make a good coffee table as is. 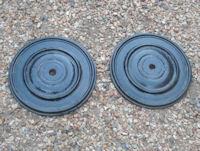 One pair of uprights have small ball finials and the other pair has a curled over design and the front of the uprights have several holes where originally rivets were fitted. Not cleaned, but very heavy and in good order. Total height 24" x 43" x 24.5". Height of flatbed 13.5". 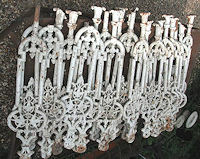 Original, quality run of mid late 19th century matching cast iron balustrades, with good cast detail. This example is in the old tired finish, in good order but needing a clean up. Other matching but larger balustrades may well be available ref code F4. Complete and in good and working order. 34.5" x 4.25" x 1.5". Price is for each. 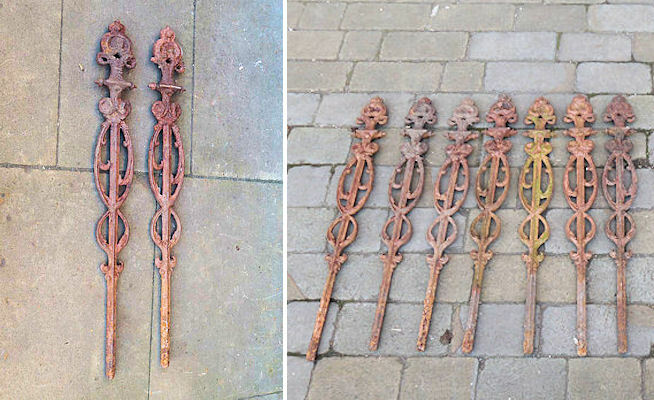 25 matching, original, quality, early to mid 19th century, cast iron balusters of a tapered cluster column form, with acanthus leaf decorations to the base and mid way. 1.5" of the length, at the base, would have been set in lead on stone. 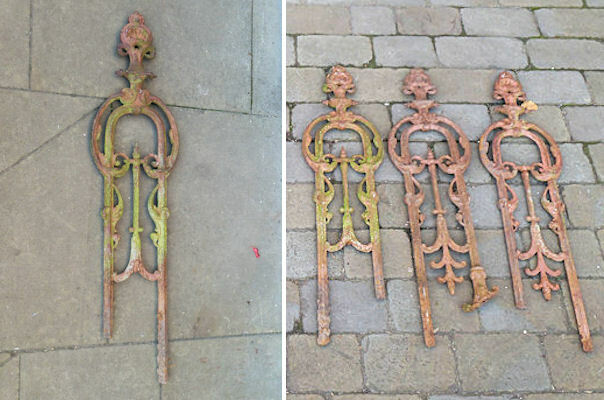 The tops are angle cut, so these were probably used on a staircase, but could be trimmed to suit a balcony or fencing on a low wall. The old paint deserves a good sand blasting, otherwise all is complete and in good order. 25 x 33.5". 2.5" x 1.5". Price is for each. 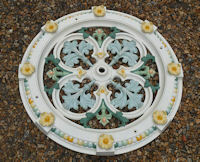 Original, quality, mid to late 19th century, fancy cast iron balustrades uprights in an Aesthetic Movement pattern to include ivy leaf designs. The top mount is adjustable to allow for steps etc. The old paint deserves a good sand-blasting, otherwise complete and in good order. 36" x 8.5" x 1". Price is for each. 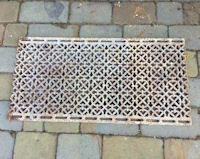 Original, quality circa 1900 / 1920's blacksmith made wrought iron gate of an unusual geometrical design. 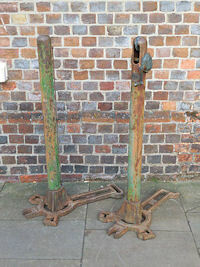 One end has two upstanding rods, one to sit in an eye on the ground and the other to fit into an eye from the side. The original latch bar has also been retained. Complete and in good order. 48" tall x 40" wide and 1" front to back. 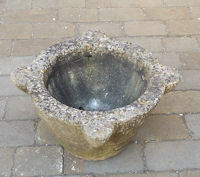 Original, quality, late 19th century, cast iron, wall mounted corner hayrack, for feeding horses, but also ideal for a wall planter. Each side has two mounting lugs, with countersunk screw holes and all is complete and in good and order. 29" wide x 23" tall. Middle ladder in picture. 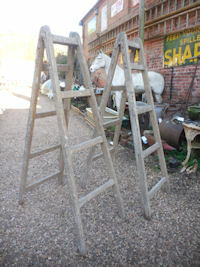 Original, quality, pre-war, 25ft 6" long, wooden builders' / roofers' ladder in what appears to be unused condition and totally free of woodworm. The wood is probably spruce or another coniferous pine wood with the rungs wire supported. 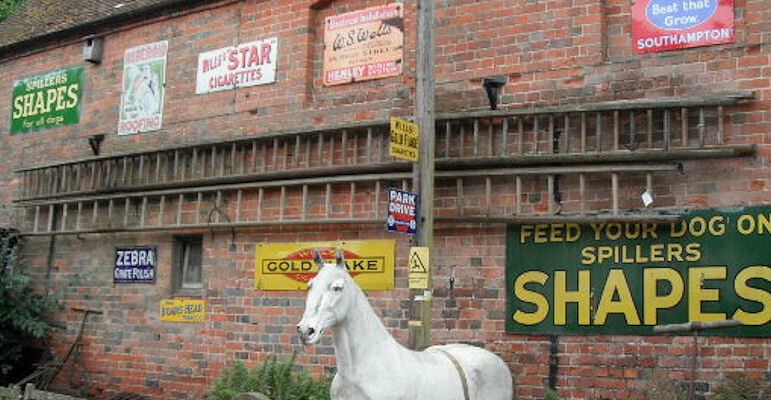 All is complete and in good order and suitable for use or as a feature display. 25' 6" x 14" to 15.5" x 4". Top ladder in picture. Original, quality, pre-war, 27ft long, wooden builders' / roofers' ladder in what appears to be unused condition and totally free of woodworm. The wood is probably spruce or another coniferous pine wood with the rungs wire supported at intervals. All is complete and in good order and suitable for use or as a feature display. 27ft x 14" to 15.5" x 4". Price is for each. 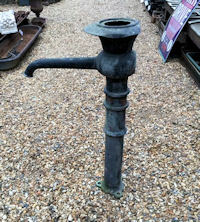 Original, quality late 19th century all copper exterior water pump in the original old patinated finish. 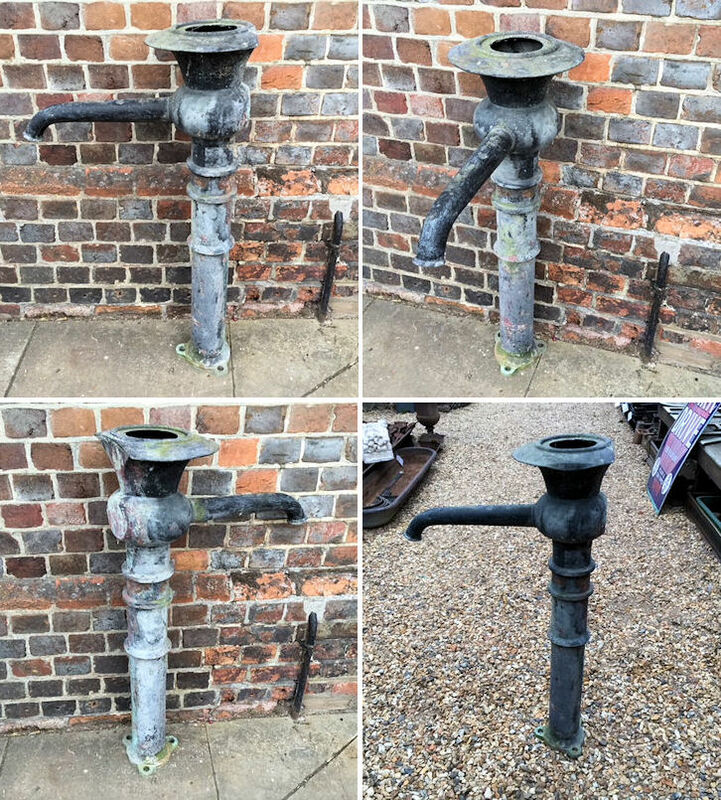 This super example does not have a handle or internal mechanism but is a great looker, of great age and perfect for a water feature in the garden. With a cast brass mounting flange to the base with three bolt holes and generally in good order but not complete as stated. 36" tall x 11" wide and 20" front to back including spout. 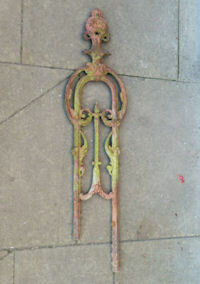 Original, quality 19th century blacksmith made wrought iron security mount for over a gate to prevent unwanted visitors. 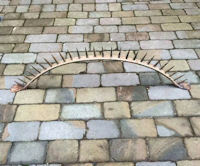 This superb work of art has a curved shallow arch form with mounting plates at each end with three screw holes to each and 26 square spikes looking very serious. Complete and in good order. 51" long x 14.5" tallest including spikes. 2" strapwork and 3.25" wide splayed mounts, each spike 3.5". Original, quality three piece late 19th century cast iron window sill bars to be recessed into a leaded infill on window ledges or a low wall. 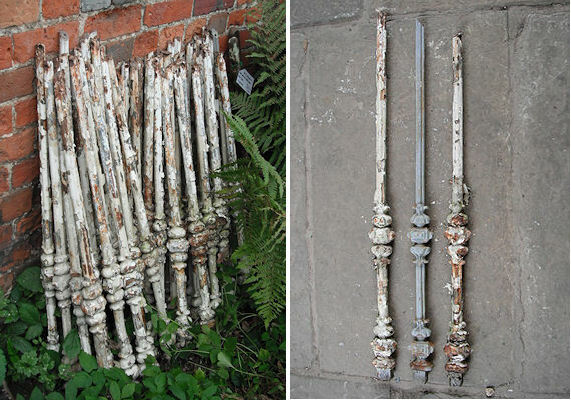 These three pieces match each other, possibly for a bay window sill, the long one for the centre sill. The overall design has a Gothic feel with a barley twist to the cross bars. All in old paint and one finial missing otherwise all is complete and in good order. Large 50" long 2 x smaller 28" long all 15.5" tall plus 1" to be set in lead. Price is for the set. Original, quality, late 19th century, Scottish, wall mounted, cast iron street sign detailing "Seabank St." in a rectangular shape, with canted corners, a bead to the outer edge and two screw holes for mounting. In the old paint awaiting cleaning, but otherwise complete and in good order. 34.5" x 5" + 0.5". Original, quality, late 19th century, Scottish, wall mounted, cast iron street sign detailing "Townend St." in a rectangular shape, with canted corners, a bead to the outer edge and two screw holes for mounting. 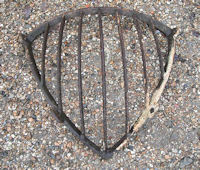 The lower rim is also embossed "Grangemouth Iron Co Falkirk" for the maker. In the old paint awaiting cleaning, but otherwise complete and in good order. 27" x 7" + 0.5". Original, quality, late 19th century, Scottish, wall mounted, cast iron street sign detailing "Courthill St." in a rectangular shape, with canted corners, a bead to the outer edge and two screw holes for mounting. 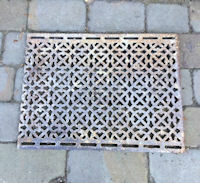 The lower rim is also embossed "Grangemouth Iron Co Falkirk" for the maker. In the old paint awaiting cleaning, but otherwise complete and in good order. 27" x 7" + 0.5". 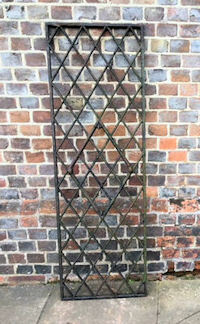 Original, quality late 19th century tall rectangular shaped cast iron window with glazing bars for small diamond shaped glass panels. This window was from an estate cottage on the "Sutton Estate" in Berkshire, originally part of the "Sutton Seeds" Empire. Complete and in good and working order but needs re-glazing of course. Another matching window of the same size may well be available ref code: W449, but with an inner opening panel. 57" tall x 18.5" x 7/8" front to back. 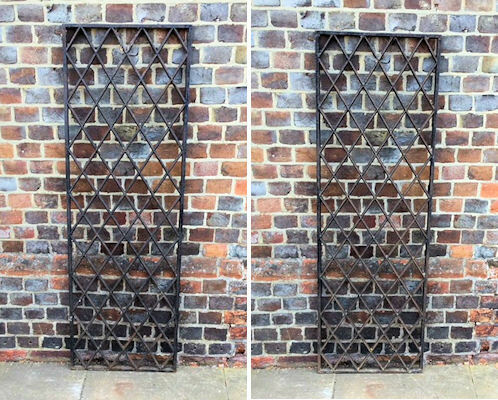 Original, quality late 19th century tall rectangular shaped cast iron window with glazing bars for small diamond shaped glass panels. This window was from an estate cottage on the "Sutton Estate" in Berkshire, originally part of the "Sutton Seeds" Empire. This example has an inner larger shaped hinged window section within and all is complete and in good and working order but needs reglazing of course. Great as a window or glazed for a mirror. Another matching window of the same size may well be available ref code: W450, but this one does not have the opening inner section. 57" tall x 18.5" x 7/8" front to back. Inner hinged window 20.5" x 12". Click on photo for larger and view. 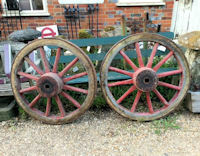 Original, quality pair of late 19th century cast iron wheels each with six spokes and each spoke bearing a letter to one side. these letters spell 'WILMOT' for the maker. 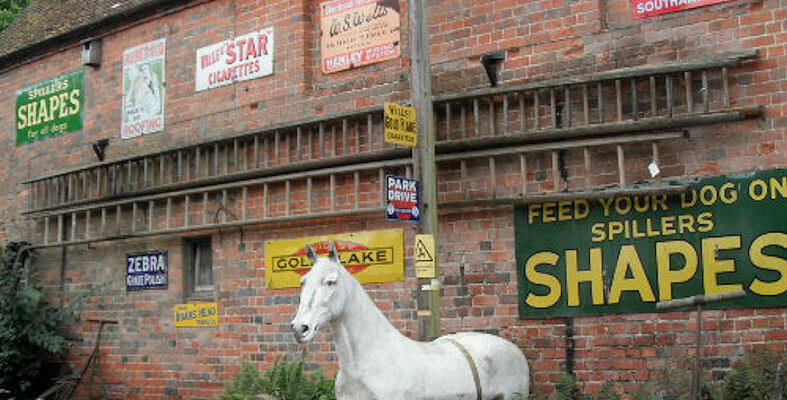 All in old weathered finish and complete and in good and working order. 12" diam x 2". 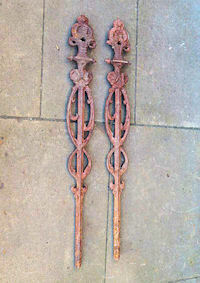 Original, quality pair of heavy early 19th century cast iron wall tie plates of a circular form with good detail. All has been cleaned and repainted black to the front and red oxide primer to the reverse. Complete and in good and working order. 14.5" diam and 1" thickest.